The law of competition has become increasingly important in the last decades, while markets have overcome national and continental boundaries and many economic sectors tend to concentrate towards oligopoly structures. Moreover, the international dimension of many industries often requires commercial lawyers to consider the antitrust implications of deals and M&A operations in several jurisdictions at the same time. 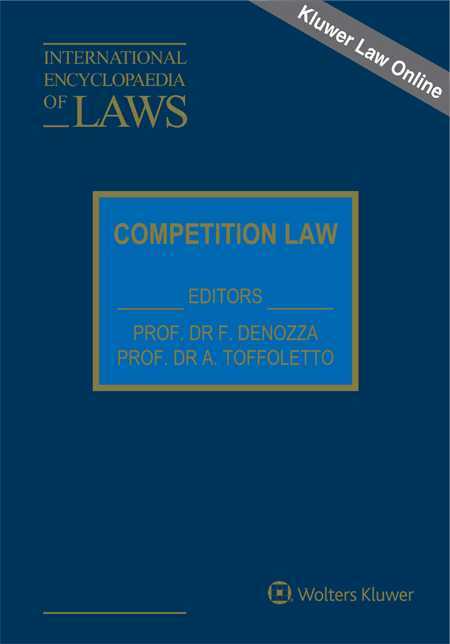 The International Encyclopaedia on Competition Law aims at providing an in-depth description of the antitrust laws of more than 30 Countries, including the U.S. Federal Acts and the legislation of the European Community. Each monography will include a description of the substantial as well as the procedural rules of a particular jurisdiction and will provide a description of the leading cases, together with an essential bibliography. For detailed information on all volumes of the Encyclopaedia, please visit: www.IELaws.com. 4. Historical Background of Antitrust Law Selected Bibliography. Part I. Structure of Antitrust Law and its Enforcement. Chapter 1. Sources of Antitrust Law. Chapter 2 . Scope of Application. Chapter 3. Overview of Substantive Provisions. Chapter 4 . Overview of Main Notions. Chapter 5. Consequences of Violations And Enforcement Institutions. Part II. Application of The Prohibitions. Chapter 2. Dominant Undertakings' Prohibited Practices. Chapter 1. Administrative Investigations before The Antitrust Authority. Chapter 2. Voluntary Notifications and Clearance Decisions Merger Control. Chapter 3. Challenging of The Administrative Decision. Index.